Nicolas Pelzer Collider Body (2017) Installation view. Courtesy the artist + Future Gallery, Berlin. Nicolas Pelzer 'Collider Body' (2017) Installation view. Courtesy the artist + Future Gallery, Berlin. Nicolas Pelzer 'Cockpit Rule - Leaking Solos' (2017) Installation view. Courtesy the artist + Future Gallery, Berlin. Nicolas Pelzer 'Cockpit Rule - Counterbalance' (2017) Installation view. Courtesy the artist + Future Gallery, Berlin. Nicolas Pelzer 'Evolving Masters - Lantern #2' (2017) Installation view. Courtesy the artist + Future Gallery, Berlin. Nicolas Pelzer 'Evolving Masters - Lantern #1' (2017) Installation view. Courtesy the artist + Future Gallery, Berlin. Nicolas Pelzer 'Cockpit Rule - True Sided' (2017) Installation view. Courtesy the artist + Future Gallery, Berlin. 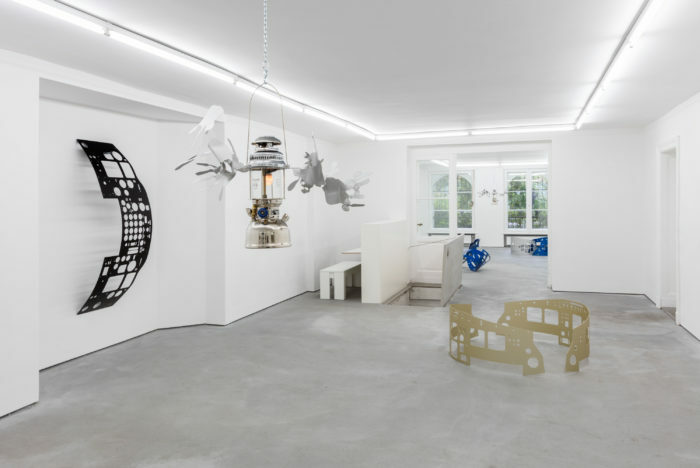 Nicolas Pelzer 'Cockpit Rule - Cooperative Circle' (2017) Installation view. Courtesy the artist + Future Gallery, Berlin. Nicolas Pelzer presented Collider Body at Berlin’s Future Gallery which opened September 9 and is running to October 21. Nicolas Pelzer presented Collider Body at Berlin’s Future Gallery which opened September 9 and is running to October 21, 2017.